Select a location on the map below to view an interactive image gallery of the facility or to get directions. We are Toledo's Preferred Local Car Wash with 7 great locations to serve you. Our facilities offer Soft Cloth and Touch Free Automatics, Do-It-Yourself Bays (coin or credit), Vacuums and a Variety of Car Care Products to keep your car looking good inside and out. CARess Car Wash provides trouble-free service with EASY TO OPERATE wash bays! For added security, CARess Car Wash has 24 hour surveillance cameras along with high intensity lighting after dark! We offer Fleet/Gift cards and accept all major credit cards. Keep your car interior spotless with our carpet shampooers and super-suction vacuum islands! We offer a large selection of CAR CARE PRODUCTS for your convenience! Using CARess Car Wash helps our environment by using less water! CARess Car Wash protects your car from acid rain damage and rust damage due to rust! CARess Car Wash has been family run and locally owned and operated since 1989. 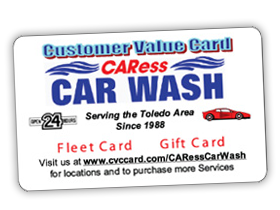 You can save up to 30% at our Car Washes when you Use your Caress Car Wash Value Card! Don't have a CARess Carwash Value Card yet? Click here to get one today! Copyright © 2019 Caress Car Wash. All Rights Reserved.